Don't complain. Make a change. — Spruce Rd. at the 99U conference. She is such an encourager, inspiration and entrepreneur that I look up to for countless reasons! I sometimes find myself becoming frustrated at a situation, process or service, and allow negativity to take comfort in my thoughts. On the outside this seems like a terrible habit, though I think when approached with the appropriate attitude it can have a positive outcome. Each of us is uniquely different than each other. We have different God-given gifts and abilities. If we see a problem, instead of allowing that negativity to consume us, we can make the choice to make a change. 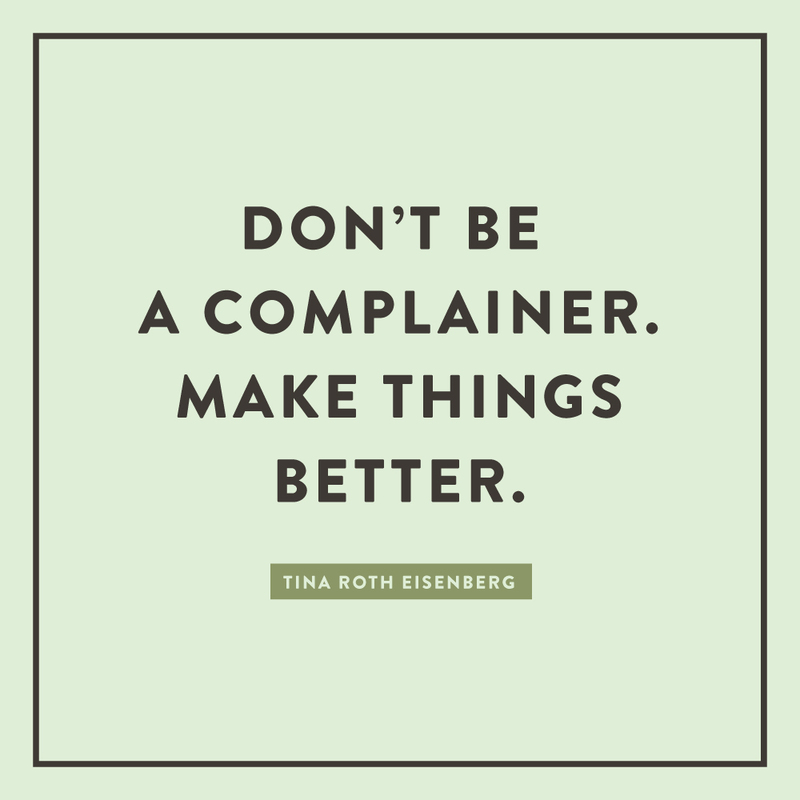 As Tina has mentioned in her previous talks, if you find yourself complaining about the same thing over and over — you either need to let it go, or do something about it. I absolutely love this notion that we need to stop complaining, and make a change. From a personal note, this quote resonates with me in part of why I pursued freelancing full-time. My vision for working with clients/small businesses differed than my previous employer. Not at all saying their model was wrong, but just wasn’t fitting with me. I wanted to help small businesses in a big way. Come alongside them and understand their vision, and help them through providing a unique + creative brand identity that takes them to the next level. I value integrity, creativity and problem-solving. Prior to this, I didn’t feel I was making much of an impact. I desired more, so I made the change. Disclaimer: I am absolutely not encouraging you to quit your job because you are dissatisfied, but do not have a financial plan in place for supporting yourself! My husband and I were prepared to make the leap, allowing for a smooth transition. This mantra/quote doesn’t only apply to pursuing your own business. Maybe that is not the direction you want to go, and that is absolutely okay! It is not the solution for everybody. Here are a few ways you can make a change.
. She didn’t know how far this side project would take her, but now these tattoos are sold all over! If you have an idea for a product, app, service, or something else you see missing, just go for it! If you can’t handle it yourself, find a few like-minded people who are passionate about making the change as well. Who knows where it will take you. If you currently work at an office where you find yourself complaining about an inefficient process, or maybe there isn’t a written process, take initiative and develop a plan on your own time. I have incorporated this in the past few jobs I have worked, and it has always been well received. It shows that you are invested in your company, and are a part of the team. They hired you for a reason, so be confident and share your insight. Rather than complaining about it, approach the situation with a solution when discussing it with your team/boss. If they listen to you, your work life might become more manageable, and you also might be given more responsibility in the future. Maybe you have become continuously aware of a an opportunity to serve others. Rather than complaining that an organization, or someone else, should focus on this issue, you can take initiative and provide help. This could be someone in your office, a neighbor, friend or anyone else you see that could use some love or help. I am always blown away when others surprisingly pitch in to help out a friend or person in need. There are countless other ways to take inspiration + action from this quote. I would love to hear your thoughts in the comments below! to read a bit about my journey as a designer, through her creative interview series!